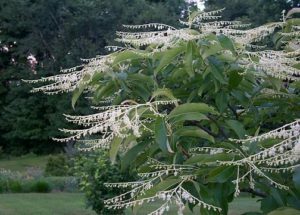 With its modest profile and year-round interest, Oxydendrum arboreum, commonly known as Sourwood, is one of the great trees for small spaces. The winter interest of many trees includes interesting bark and sourwood doesn’t disappoint. As the tree matures the bark becomes gray, ridged and scaly. In spring the branches take a back seat to 5 to 8-inch glossy green leaves which are sour to the taste, hence the tree’s common name. Summer ushers in drooping 4 to 8-inch clusters of waxy, fragrant white blooms very much like lily-of-the-valley. 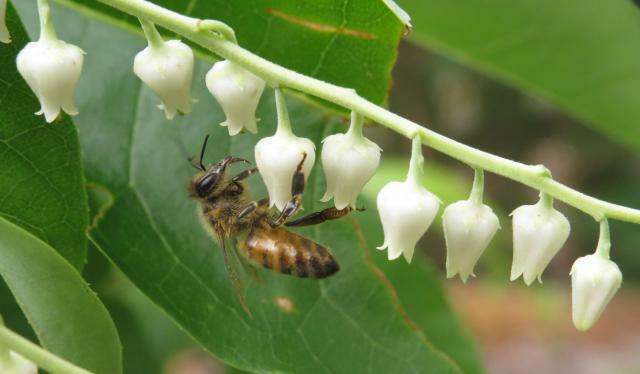 These are enticing to bees and in areas where the tree is endemic, sourwood honey is highly prized by locals. The flowers make their parting bows, making way for unusual fruit that looks like brown, wooden capsules and contain numerous pointy seeds. As enjoyable as the year has been, the show really begins in fall as the tree’s generous leaves take on intensely beautiful shades of brilliant crimson, purplish-red and sometimes yellow. Sourwood, which grows to about 20-25 feet in cultivation, has a history of healing. Pioneers used to chew sourwood bark for mouth pain; draw its sap to relieve fever and brewed leaf tea for digestive maladies. Today sorrel leaf tea is widely used to slake the thirst of mountain climbers. 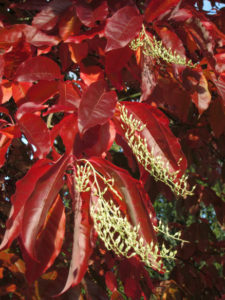 Winter, spring, summer, fall: Oxydendrum arboreum shines as a lawn specimen, a garden feature, an ornamental addition to larger trees or as a clump in a wide open space.